Shoji Hamada, (1894-1978) Squared Vase, 8 1/2" x 5 1/2" x 5 3/4"
This is the shorter version of a press-molded vase that was produced for many years in Hamada’s Mashiko studio. Made in a two-part mold and jointed along the corners, it shares both the molded technique and some of the complex geometry of the Kawai dish in the collection, as well as prominent planar surfaces for glaze treatment. The geometry here moves upward from the round base through a square body to a hexagonal neck; it has a kind of circular logic, with its round inside lip returning the eye to the base, the two sections of the vase that share the rich persimmon color of Hamada’s kaki iron glaze. Hamada had great control over his glaze palette and used local materials with freedom and spontaneity to create wide-ranging effects. This piece has been dipped in a clear limestone glaze onto which patterns are painted in iron. These panels are waxed to resist the poured and dipped copper green and iron kaki glaze. The side panels feature some of Hamada’s signature brushwork—a calligraphic pattern alternates with his signature broken sugar cane pattern. Hamada saw a typhoon damaged cane field in Okinawa in the late 1920s, and he painted this pattern for the rest of his studio production. The vase calls to mind Chinese Song dynasty square-bodied flower vases that were used as mizusashi, the water containers in the formal Japanese tea ceremony. The vases themselves revived jade forms from the Han period, an archaism that perhaps parallels Mingei explorations of old forms. In the case of this pot, the antecedent is more aristocratic than popular, as is usual with the Mingei aesthetic; this is one of the contradictions that come up in the work of educated individual artists who were aligned with the Mingei movement. Also, though Hamada refused to sign his pots, adhering to the Mingei principle of the unknown craftsman, his forms, glazes, and patterns have an unmistakable personal style, and the broken bamboo motif stands as a kind of signature. 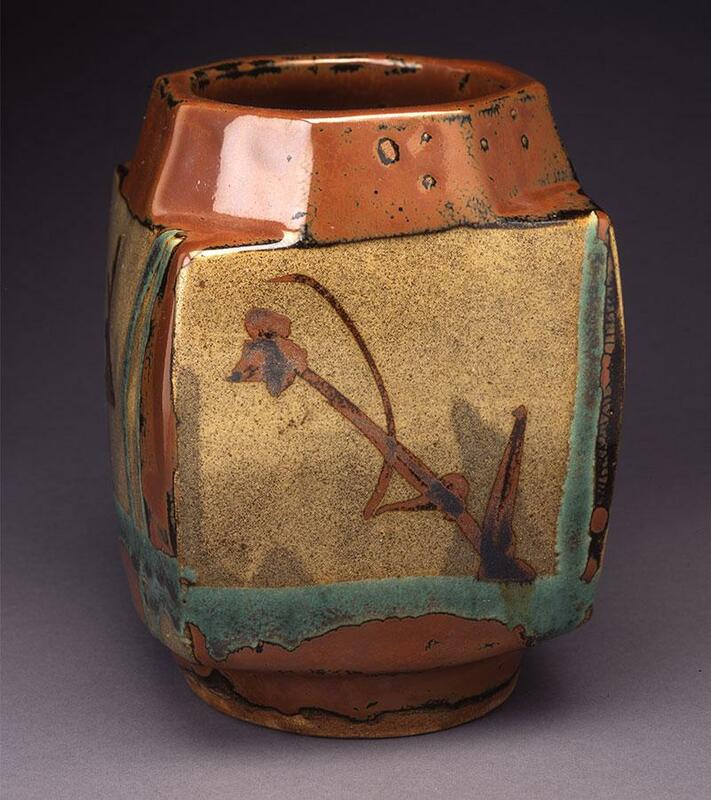 The expressive spontaneity of Hamada’s pots (and Mingei ideals in general) had a huge impact on American studio potters in the second half of the 20th century. Bernard Leach’s promotion of his work in the seminal A Potter’s Book, his biography of Hamada, and their 1952 US tour (with Yanagi) all magnified Hamada’s influence. Several artists represented in this collection—Rudi Autio, Peter Voulkos, Karen Karnes, and Warren Mckenzie—have acknowledged the significance of their encounter with Hamada during that tour. —from Innovation and Change: Great Ceramics from the Arizona State University Art Museum, edited by Peter Held (2009).